Pay the Examination Fee through Bank Draft in favour of "Director, Rajendra Institute of Medical Sciences, Ranchi PAYABLE AT RANCHI." For Gen/ UR Candidates 35 years as on 31-12-2018. 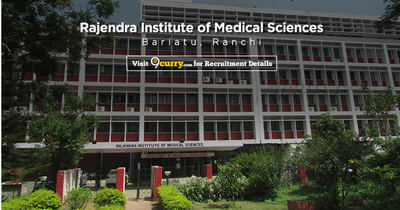 (i) B.Sc (Nursing) (4 year course) from a recognized Institute / University OR B.Sc (Post-certificate) or equivalent such as B.Sc Nursing (Post-basic) (2 year course). (ii) Should be registered with the Indian Nursing Council/ State Nursing Council. Eligible candidates may send their application in prescribed format (attached below) to office of the Director, Rajendra Institute of Medical Sciences, Ranchi-834009 on or before 30 Apr 2019 05:00 PM, along with Self-attested photocopies of the mark sheets of all examinations, certificate(s) of educational qualifications, Caste certificate & all testimonials showing experience etc. and one self-attested passport size photographs.